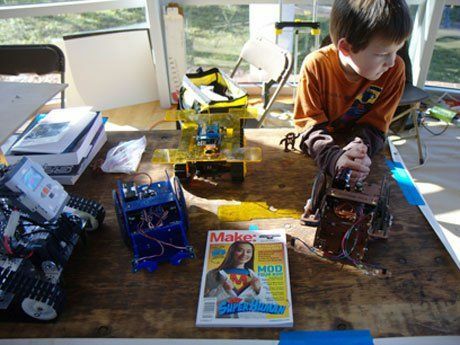 The Maker movement is poised to transform learning in our schools. To counteract educational standards, testing and uniformity, this fresh approach emphasizes creation and creativity -- products and processes born from tinkering, playing, experimenting, expressing, iterating and collaborating -- and exploits new digital tools to make, share and learn across space and time, do-it-yourself (DIY) style. Museums, libraries, community centers and after-school programs have designed physical and virtual "makerspaces" to host communities of supportive peers and mentors invested in creating everything from nail polish design and webpages to jewelry and robots . . . and now, even school curriculum. Makers, using grounded research on how students learn outside of class, are rethinking schools. The MacArthur framework for Connected Learning (CL) provides a flexible model for exploring how schools could better cultivate the interplay between student interests, peer culture, digital tools and academic success -- in other words, reconceiving schools as maker-centered environments. CL's framework for production-centered learning starts with students instead of standards, and operates on the assumption that everyone is a maker. The ultimate objective is that, with the right tools and connections, young people can develop the literacies to remake our world into a more democratic, equitable and humane place. Are you ready to transform your classroom into a vibrant makerspace where students actively make content-specific products, invent processes, and forward new ideas? If so, start by reflecting on your own experiences as a maker. How have your interests, motivations and social connections helped you develop knowledge, expertise and the moxie to make and do the things you love? Like you, students need to find nurturing places in real life and on the web to geek out with others who share their passion. They'll thrive in spaces that perpetually rekindle their desire to make meaningful contributions toward personally relevant issues, ideas, people and interests. Unapologetically flaunting the maker-centered ethos in your classroom and school is the first step to starting a maker revolution in your community. 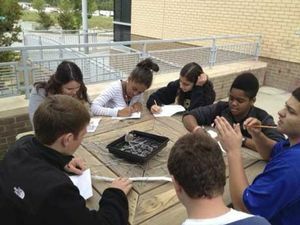 Danielle Lewis' 8th grade students at Wendell Middle School make plans and plant supports for their interdisciplinary garden project. Don't let a prescribed curriculum stop you from integrating engaging maker experiences into your classroom. Find the intersections between young peoples' interests and your curriculum. In her webinar, What Does "Interest-Driven" Look Like?, CL researcher Mimi Ito described how students develop academic pursuits when classroom content connects to their passions. She shared a story about a group of girls who were fanatical about anime. Capitalizing on that passion, they developed an interest in Japanese language and culture, and then in written Japanese after realizing that they could deepen their anime expertise by communicating with other fans in the beloved genre. If students reveal in an interest inventory that they enjoy working with digital media, leverage that interest in a science class by using new media to build content literacy -- for example, what about Einstein's greatest hits playlist, a digital story about nuclear fusion, a video game that simulates a chemical reaction, or a web page that illustrates the formation of the earth? If science students are sports or martial arts fans, collaborate to figure out how they might design experiments or text-based inquiry projects that deepen expertise around health and human performance while employing core concepts, literacies and procedures in the sciences. If your students like constructing objects with their hands, have them use Legos to build ancient city-states or manipulate them to explore mathematical concepts such as fractions and data sets. Regularly engage students in making, sharing, collaborating and reflecting. Give feedback often to help students remake and reiterate content-specific products, processes and knowledge. Encourage students to better the lives of their peers, school and community. Play multiple roles: engaged co-creator, mentor, problem-solver, activist or networker who brings the right people and tools together. According to Elyse Aidman-Adahal, Director of National Programs and Site Development at the National Writing Project, makerspaces feature low barriers to content access and high ceilings of opportunity and achievement. We are all makers, and when we share, engage, reflect and remake, we become masters. Following are some resources and projects to get you started. Middle School: How Does Our Garden Grow? Please share your maker resources and experiences in the comments section below.